My mother bent over the sink with a butter knife, scraping mud off the chunky red brick heels of my Hush Puppies. The knife tinged and sang as her arm brought it across my shoe, dirt and gravel chunking down on the porcelain. The sky outside the sink window was gray and dripping with slow fat rain, the kitchen dark with afternoon. My mother, though, was warm and brown. Her skin smooth like a nut, soft thin hair uniform and light on her arms. Her eyes, hidden behind cat glasses, the rims green and white streaked, were darker than mine. Sometimes, I couldn’t see her pupils. And her hair was the brown of no color, not chestnut, not dishwater blonde, but all the browns in between. She turned back to my shoes. She had to know there was no choice. All this mud was her decision. Because our street, El Verano, made a sharp, dangerous turn, in order to get to the school bus safely, I had to cut across the Michaels’ backyard to the next street, Las Vegas, and in November, with the first big rains, I sunk in to my ankles, the mud sucking my feet up in slurps, plunging them both down again. The mud hadn’t been a problem on the weekends when Jeff Michaels and I ran around in our sneakers, tossing wet handfuls at each other, rubbing the goo (thick enough to later make play brownies) on our faces, inhaling the earth smell: wet worms, ground rock, moss. My mother tried to let my fine mutt-colored hair grow, but she hated combing it; this in the time before cream rinse. I remember the Ace combs we had back then, thin, hard, black. I can feel the teeth still, stiff as fingernails, running down my scalp, clinging to barriers of knots. But by the time of my kindergarten class picture, I had the first of many short haircuts, bangs a crooked fence across my forehead, a desperate curl lurching upward and then silenced by the scissors. I looked at the box, usually the conveyer of something more alluring, new shoes, or something for special occasions, the crinkly sound of the tissue seductive and thrilling. But these white rubber boots were formless, wide mouthed, vacant. Each had a button and an elastic lasso on the top sides—left on the left leg, right on the right leg. “Nobody wears these,” I said, looking at my lumpy foot, thinking that it looked like Casper the Friendly Ghost, something that might have encouraged me, but none of the children wore boots over their shoes. My mother had no idea what to do about mud. She was from Hampton, Iowa, and grew up with long winters, snowstorms, salty driveways, shovels, and icicles two feet long. Winter was a four-month event, sometimes longer, and my mother had always been tucked away in the house, always warm, reading a book, watching her mother cook. She once showed me a picture of herself in her winter wear. There she stood by the river rock fireplace with her long Dorothy braids and a smile I did not recognize. She held me on her lap, pointing out what she wore: long underwear, leggings, a dress (always a dress), a sweater, a coat, a scarf, a hat, mittens, and thick leather boots. And then the school bus picked her up right in front of her house and dropped her off a hallway away from her classroom. In the afternoon, when the light shaded to arctic gray, the bus picked her up and dropped her off back at home. California mud was new to her, pools of it gathering in backyards and school yards, ready to swallow down a Mary Jane and sock. Each morning, I was forced to leave my mother and sister Sally at home, where I felt warm and enjoyed the comforts of mornings reading, playing with my toys, making forts from the dining room chairs and the old black and pink afghan Grandma Barksdale crocheted. We woke up just before my father left for work at Standard Oil in our only car, leaving the three of us home together all day. The rhythms of our house were like my pulse. I knew the feel of the afternoon just before nap time, understood the difference in sound from when my mother stacked dishes in the cupboard to when her coffee cup hit her saucer. I knew what my sister’s looks meant, understood the messages in her dark eyes, her eyes just like my mother’s. “Sally wants a cookie,” I said as Sally pointed to the kitchen. She didn’t talk until I left for kindergarten. She didn’t need to. Yet that fall, I had to walk to the bus stop, find a seat on the bus, and then spend the morning figuring out how to do the right thing for Mrs. Bolander. Even with my teacher standing over me, it took me months to make J’s instead of L’s when writing my name, and I was never the mom when playing house, other stronger children determining who could be what. Sometimes I was the father and once the dog, but mostly I was the younger sister, usually being punished for throwing blocks or eating someone’s birthday cake. And every day at nap time, I held my body still and rigid, barely breathing, hoping to be picked to be the Wake-up Fairy. Mrs. Bolander said the best behaved, quietest child would be picked to wake up all the other sleeping children. What I really wanted was to wave the glittery wand and to wear the jeweled plastic crown of Wake Up Fairy. I lay on my towel for twenty minutes every school day, waiting. I didn’t understand how a body could be more still. The boots would make everything worse. But my mother’s smile, the soapy smell of her hair, her arms around me as she pulled the boots on over my Hush Puppies gave me hope. The next rainy day, I left our back porch, slid stepped down the brick steps, and clumped through the mud in our yet unplanted back yard. As I opened the gate between the Michaels’ yard and our own, I knew I would miss the muddy tongues running over the tops of my shoes because it had always meant I had free time at the beginning of school to scrape off the drying mud. No one at the bus stop had boots on, but I don’t think anyone said anything. I can still feel that expectancy, waiting for a remark, a look. And I am not sure why I didn’t figure out that none of them knew what to wear unless their mothers told them. I didn’t have the strength to say, “Look at my new boots. Aren’t they neat! ?” and to stick my leg out and show the wet, shiny white boot to Bunnie, Susan, Jennifer, Gwen, Lori, Chuckie, Amy, and Chris. Maybe I knew the older kids might already know boots were stupid. So, instead, I felt my legs curl under me like the leg of the Wicked Witch of the East. At school, I ran to the coat closet, hoping to see twenty-two pairs of boots lined up, wide open and empty like dead fish eyes. But there weren’t any, and I felt my aloneness like an electric shock. Nothing I was learning now proved to me my mother was right—the socks she picked out for me kept slipping under my heel, and she bought me PF Flyers instead of Keds. I sat in the closet and breathed in the dusty chalk smell and then pushed my boots as far back as I could. “Girls! Be quiet,” said Mrs. Bolander, looking at me over the book. So I nodded, disappointed, unable and unwilling to tell Diane about my boots in the closet. After a couple of weeks of rain and boots, I was pushing down a quiet rage. I could almost forget about it at home, but something wanted to burst out of me when I walked down the street, skidding with every step on the slick asphalt. No child laughed at me or called me boot baby or said my boots were stupid, but inside, I knew I looked stupid. Every morning at school, I rushed to the closet, sliding my boots to the back. Every afternoon, I waited at my desk, Mrs. Bolander looking at me expectantly, anxious for me, for all of us, to be gone. I slowly got up, pushed my chair back, walked toward my boots. One morning, I walked down Las Vegas, and then slipped in behind the Japanese Box hedge in the Dickinson’s yard. I waited until I heard the bus lurch into second gear, straining up La Espiral. I pulled myself out of the hedge and slowly moved down the street, pretending that I had missed the bus accidentally. Here I was, a good girl, hurrying to make it to school. I was watching the children get on the bus, one after the other, when Mrs. Michaels pulled up in her car. “I am hurrying,” I replied, moving my feet faster but still going nowhere. “I can do it,” I said, scuttling in my boots. Mrs. Michaels looked at me, her eyes heavy with eyeliner, her brown hair teased and shiny. I thought about the makeup she had given my mother; how, after a couple of weeks, my mother let the thick black mascara and blue eyeshadow sit unused in the drawer. I opened the eyeshadow case carefully each time I went to the bathroom, running my finger on the silky aqua surface. “You need to hurry,” she said. “Okay,” she said, slowly driving up the hill, looking back at me in her rearview mirror. I waved to her and moved my arms faster, mimicking the runners I had seen on television. When the bus left, I ran back home, sliding through the mud, closing the Michaels’ gate behind me. My surprised mother opened the backdoor and let me in. Sally was playing in the den, and I sat down with her without giving my mother an explanation. “Let’s make a fort,” I said, pulling the afghan off the couch. I remember that room full of warm light—pumpkin colored from the low watt bulb in the yellow lamp—smelling like coffee and my mother. Maybe Mrs. Michaels called my mother, and I can only imagine the discussion. Something happened, and the next day there was a new plan. 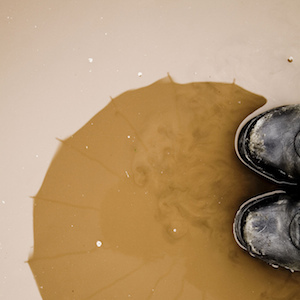 “After you get through the mud, you can take your boots off. Leave them under the Michaels’ front bench,” my mother said. I must have followed this plan until late spring when the mud dried and cracked into tiny white islands in the Michaels’ backyard. But it was too late. I had already worn the boots. The bigger world betrayed me by being different, and there could be no warm, pumpkin lit room any more. I had no choice but to give myself over to the world entirely because my mother could not translate the questions it asked me. I left such beauty, my mother and my sister, though I still carry that time in my body like a warm circle. I would never love them, or anyone, in that way again. I carried those boots throughout kindergarten, and even when the rubber was hard, yellowed, and crusty, and Sally and I used them as caves or swimming pools for our dolls, I could still feel my feet sliding in them. I could still feel myself slipping. Read The Story Behind “Boots” on our blog. Jessica Barksdale is the author of twelve traditionally published novels, including Her Daughter’s Eyes and When You Believe. Her short stories, poems, and essays have appeared in or are forthcoming in Salt Hill Journal, The Coachella Review, Carve Magazine, Mason’s Road, and So to Speak. Her latest novel is forthcoming in the fall from Ghostwoods Books. 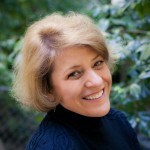 She is a professor of English at Diablo Valley College in Pleasant Hill, California and teaches online novel writing for UCLA Extension. You can read more at www.jessicabarksdaleinclan.com.